“What do you want me to do?” I asked, apprehensively. “Just stir it and turn it down when it’s ready” he said, his head popping back around the door frame, looking somewhat confused by my reaction. “Okay, so when do I flip this?” I countered. I was really concerned this whole thing was not going to end well. Standing in the kitchen of my new boyfriend’s apartment, less than a month into the relationship, he had started lunch for us, gone off to do something and asked me to keep an eye on it. My fear that I’d ruin it was not unfounded. I wasn’t always a good cook. And I had burnt simpler meals (i.e. frozen Mc Cain mini pizzas). Burning lunch was not exactly one of the first impressions I wanted to make. It’s not that I felt some need to show him I could cook so he’d think I was good marriage material. I was 19 years old and had no interest in conforming to gender stereotypes. But that wasn’t the point; I didn’t want to be so useless in my life that I couldn’t even make tomato soup and grilled cheese without burning them. Although I loved to bake from a very young age, I really didn’t have a lot of interest in cooking. To me, cooking was something you did because you had to eat, but baking… well, baking was just plain magical. The transformation that occurred between counter top and cooling rack was mysterious and metamorphic. And this pumpkin pie recipe was no exception. In the warm cocoon of the oven, pumpkin, flour and a few other simple ingredients underwent a miraculous transformation that resulted in the creation of this silky, gloriously delicious pie. I have been baking and eating this pumpkin pie since I could eat and bake. And it was one of the first solid foods I fed both my kids. My Mom made it for almost every holiday dessert when we were young and it was something we looked forward to at Easter, Thanksgiving and Christmas. It is still one of my favorite things to bake and eat. I especially love this recipe because It is truly the best pumpkin pie filling I have ever had and I got it out of my very first cookbook (“A Guide to Good Cooking” – The Five Roses cookbook). First published over 100 years ago, it still houses many of my “go to” recipes, including this one. As you can see, the book has been well-loved over the years. With Easter just days away, I thought about making something different this year, but I just couldn’t think of anything that would rival my prize pumpkin pie. I have tried to mix it up and made other Easter desserts in the past, but it wasn’t the same. So this year we contentedly eat pumpkin pie again. Thankfully, I managed to keep the soup and sandwich from burning that fateful lunch date nearly 30 years ago. And perhaps that was what gave me enough confidence in my culinary skills and the inspiration to keep going, because I started to venture into the cooking realm around that time. 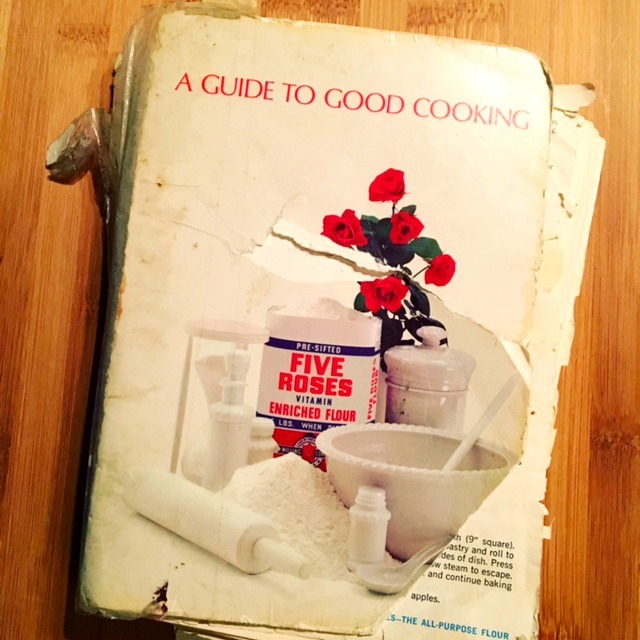 And my Five Roses cookbook, full of simple, basic recipes, served me well during that period. A little more than 2 months after that lunch, I made my then boyfriend/now husband my very first meal where I cooked more than one thing on the stove at a time; deviled eggs and Kraft dinner with hamburger. Don’t ask. I guess, since those were the only two non – baking things I knew how to make at the time, cooking them together made sense. Still, I was pretty proud. Years later, the ‘grilled cheese and tomato soup’ incident is still something my husband and I laugh about when we’re reminiscing about the good ol’ days, as well as the unfortunate pairing of deviled eggs and Kraft dinner. Fortunately for him, my cooking and meal planning skills have evolved in the decades since those meals. And credit to him for much of that – he was able to teach me a thing or two about cooking and encourage me along the way. Fortunately for me, he’s a great cook. Luckily for both of us, we both turned out to be pretty good marriage material! Easy to make, silky, smooth and magically delicious, this pumpkin pie is the perfect holiday dessert! 1 cup scalded milk *See video in notes on "how to scald milk"
Preheat oven to 450 degrees F. Mix all ingredients together, except whipped cream. Pour into unbaked pie shell and bake for 10 minutes. Reduce oven temperature to 325 degrees F and bake 30 to 40 minutes or until filling is firm (knife inserted in centre should could out clean). Cool before serving. If desired, serve with whipped cream. Love how you added the instructions for scalding milk. So helpful! Very simple and easy recipe. Thanks for sharing. 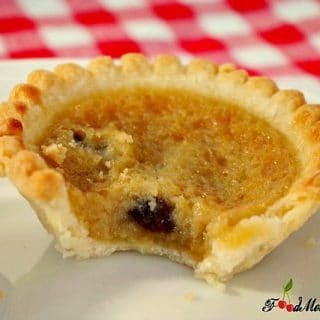 I am intrigued by the addition of flour in the pumpkin pie filling – I must try this recipe. I loved seeing that old cookbook – I can see that it is well loved. Thanks for sharing this recipe. Thanks, Denise-I’d love to hear your feedback!